I am a huge fan of front-mounted child bike seats. Out of all the riding we’ve done with our son over the last 3 years, 80%+ has been in a front bike seat. Unlike other types of child bike carriers, in a front seat, you can see, talk, and interact with your child. If you’ve seen tiny tots riding around, perched between their parents arms, and are curious if this option might work for you, read on. I’ll go over the benefits and drawbacks of front-mounted child/baby bike seats, and then list the best seats that are on the market. What is a front-mounted child bike seat? A front-mounted child bike seat is installed at the front of the adult’s bicycle over the top tub and just behind the handlebars. Depending on the brand, it attaches to either the headset or the seatpost. 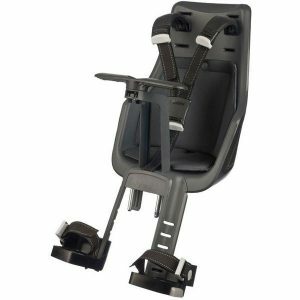 The standard front-mounted seat has a harness to keep the child safely strapped in and these are appropriate for older babies and toddlers (ages 1-3). Some newer models on the market are designed for slightly older kids (ages 3-6) and these are open seat designs without a harness. Compared to a rear-mounted bike seat or a trailer, the front-mounted seat is incredibly interactive. You can see your child without stopping or turning around, and you can have a conversation without yelling. Because the kiddo is right up front they also get a great view of everything that is going on. We have a bell on each of our handlebars, and my son loves ringing them and singing while we ride. Compared to a trailer, the front-mounted seat is also lighter, cheaper, and more capable of fitting thru tight spaces. Another benefit is the ability to travel with it. In fact, we’ve flown with our iBert several times in a regular duffle bag. Who does a front-mounted child seat work best for? I recommend front-mounted seats to parents who have decent bike handling skills and feel confident on a bicycle. There is always a crash or tip-over risk when you have a child up front on your bike, so this needs to be a risk that you feel comfortable making. Personally, we’ve ridden on a near-daily basis for three years with different front-mounted bike seats and our son has never gotten so much as a scratch in a bike crash. (We have had a non-crash accident on our Tyke Toter). There’s also a pretty obvious age limit with front-mounted seats and they work best with toddlers. We started riding with our son just before his first birthday in an iBert. Most of these seats will work to a max of 35 lbs, so their lifespan is pretty limited. We’ve since moved on to the TykeToter, which along with the Mac-Ride, will allow kids up to 5 to continue riding front-mounted. Kids older than that are best off on a trailer-cycle or a cargo bike. As I already mentioned, there is a crash concern with a front-mounted seat. In the event of an endo (basically where you do a sumersault over your bars), there’s a good chance your child is going to get hurt. Of course, there is always a crash concern any time you are cycling with (or without) a child, but the front-mounted seat does expose the child more than a trailer, for example. Riding with a front-mounted seat can also be a bit awkward. For some people, this is just an adjustment. For others, it’s a complete deal breaker. The bike seat is right where your knees are generally hitting, so there is some amount of bow-leggedness that occurs. This isn’t that much of an issue on short rides, but it can become a problem if you are riding long distances. Getting on and off the bike with a seat is also a bit awkward, and requires a fair amount of good balance and bike handling skills. Some parents like adding a kickstand for loading and unloading. The final problem with front-mounted seats is compatibility. Depending on what kind of bike you have, you might have to try several seats before you one that fits. Age and weight: For a young toddler, you are definitely going to want to choose a seat that allows them to be strapped in (i.e. the Yepp Mini or the iBert). 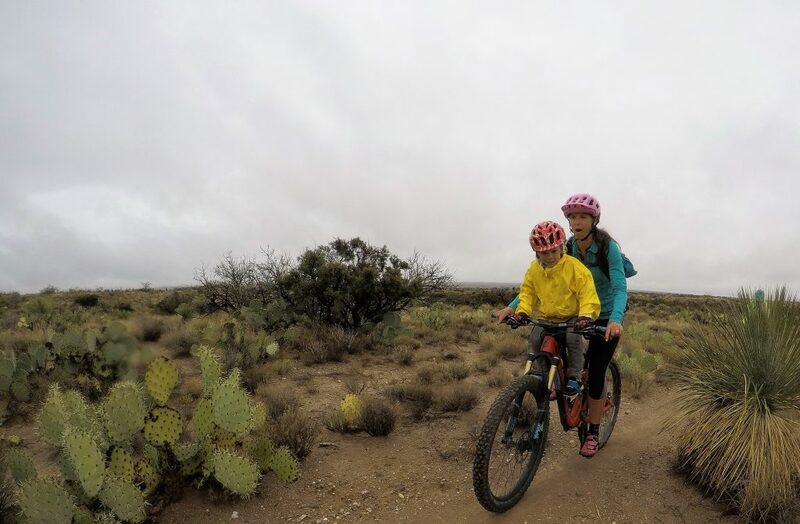 Once kids have outgrown the weight limit (usually around 35 pounds), you can switch them to a more open-style bike seat like the TykeToter or MacRide. Use: There’s no one best seat. There is, however, probably a best seat for what you want to do with it. What’s your intended use for your seat? The occasional Saturday afternoon bike path ride? (Consider the BoBike Mini). The daily preschool drop-off? (Choose the Yepp Mini). Do you want to use it offroad? (Pick the iBert or MacRide). Do you plan on leaving the seat on one bike, or do you plan on switching it frequently between different bicycles? If you plan on the latter, choose a seat that installs quickly, like the TykeToter. These bike seats are best for babies and young toddlers. They all have harnesses to keep your child safely strapped in and offer plenty of support. (If you are looking for a bike seat for older toddlers and young children, scroll down to the next section). The Yepp family of products are stylish and functional. These seats come in bright, fun colors and are exceptionally well made. The one thing I really like about the Yepp Mini when compared to other seats is the high back that provides neck support. Combined with the optional “sleep roll” the Mini allows kids to sleep in the seat, something I’ve learned toddlers love to do. The Mini fits kids up to 33 pounds. 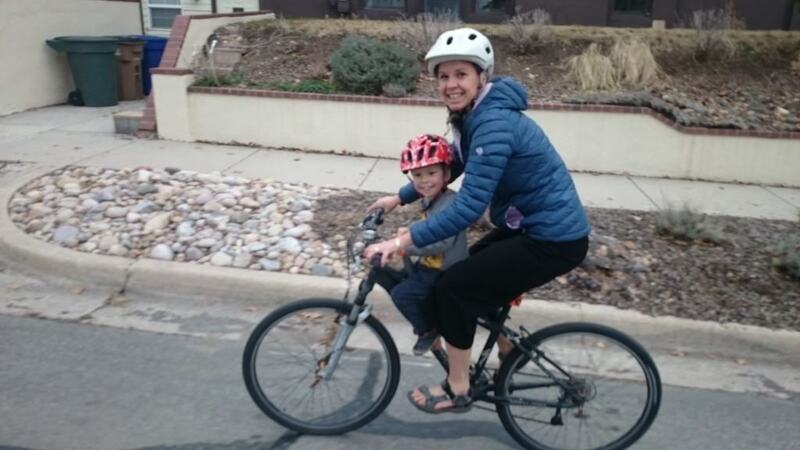 While I think the Yepp Mini is the nicer overall seat, we chose the iBert for biking with our son primarily due to the ability to use it for mountain biking. Yes, that’s right, you can use the iBert even on singletrack. 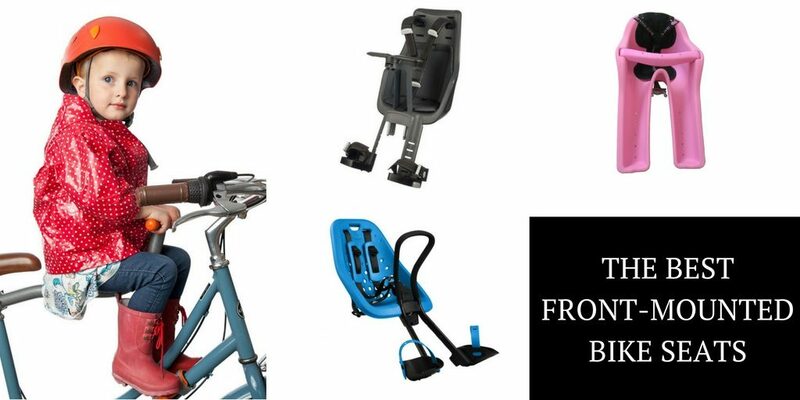 The iBert is probably the most commonly used front-mounted seat in the U.S.—and for good reason. Its simple design means it is easy to install, to keep clean, and to afford. The iBert comes in green and pink, and fits kids up to 38 pounds. 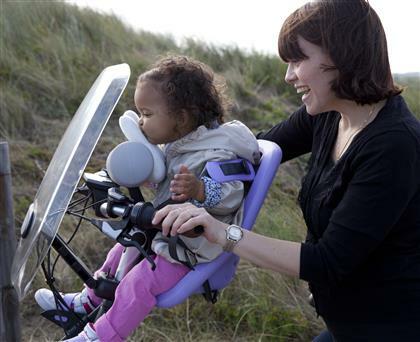 For more info, read our detailed review of the iBert. Like Yepp, the BoBike seats are imported from the cycling-smart people of the Netherlands. For safety and comfort, the BoBike seats can’t be beaten. The adjustable harness is superior to any of the other seats listed here, and a water-repellant cushion provides a comfortable ride for the child. The seat fits little ones up to 33 pounds. The TykeToter is distinctively different than the other seats listed above in that it does not have a harness and is intended for young children rather than toddlers. The best thing about the TykeToter is how easy it is to install (no tools required) and to travel with. Full disclosure: we had an accident with this seat when we first got it (see my full review on this topic), but since then we’ve been riding with this seat on a near-daily basis because it is so fun and easy to use. Fits kids ages 2-5 (although I’d recommend waiting until 3 or so). For more information, read my detailed review of the TykeToter. The MacRide is our favorite toddler bike seat. The seat is a similar concept to the TykeToter, but has added safety features and a higher weight limit. It’s also designed specifically for mountain biking if you’re into that kind of thing. Fits kids ages 2-5 and will cost you $199. For more information, read our detailed review of the Mac Ride. Use the comparison chart below to help you choose which seat is right for you and your child. 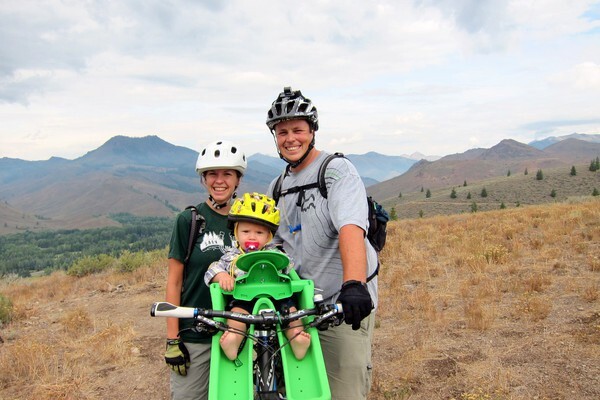 When Can you Start Biking with a Baby? Great post! CZ is topping out on her Yepp Mini and I will really miss our biking chats and sing alongs. I think we are going to get another cargo bike for the carrying capacity (beach time in the Southern Hemisphere!!) so she will be behind me. What do you think about th Thule ridealong bike seat?